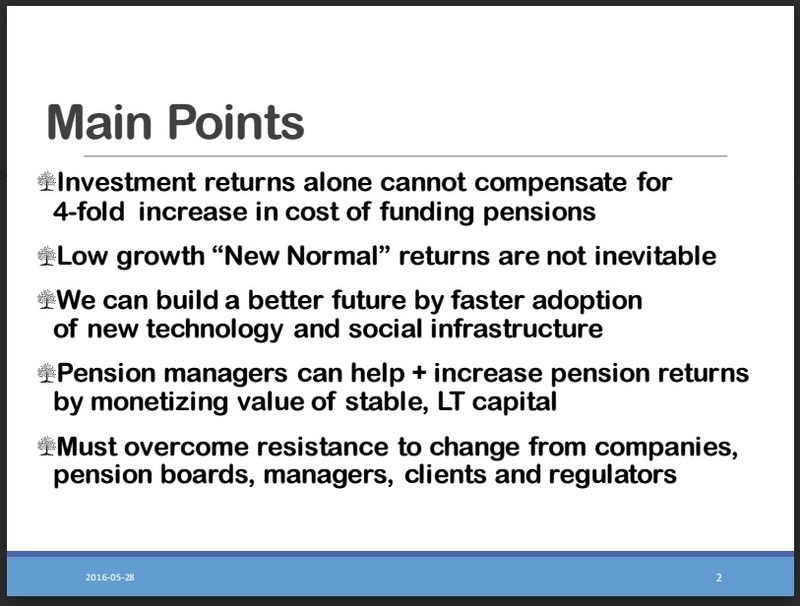 Low interest rates and weak growth are here to stay at least in the near-term, and the world must adapt, according to a group of leading economists at the kick-off session of today's International Pension Conference of Montréal (IPCM). During the session, entitled Macroeconomic Outlook on Interest Rates: How Do We Adjust our Expectations in the "New Normal?" panelists addressed the impact of central banks' monetary policies and interest rate cycle. Session moderator Clément Gignac, Senior Vice President and Chief Economist at Industrial Alliance began the session by explaining that, "The world has changed. Central banks have used traditional monetary policy tools close to their limit. As of now, nearly $8 trillion of government debt carries negative interest rates, which is a real challenge for asset managers and pension funds. We need to think of a new approach to tackle these challenges." Panellist Marc Lévesque, Vice President, Economics and Market Strategy at PSP Investments, stated that investors must be prepared for conditions characterized by slow growth. 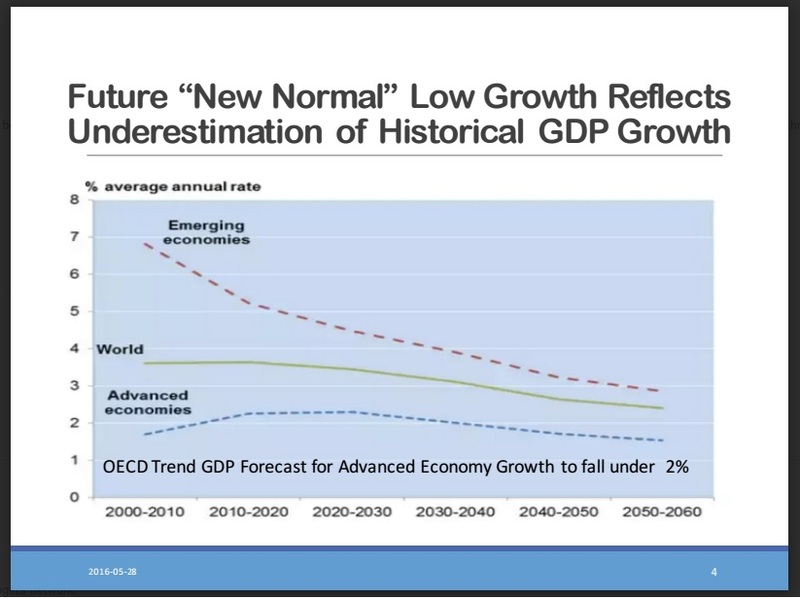 "Economic growth will continue to be slower than in the past, mainly because of demographic trends. Though rates will not remain unusually low forever, long-term equilibrium rates are lower and the 'normalization' of rates won't happen overnight," he said. Peter Berezin, Chief Strategist, Global Investment Strategy at BCA Research, said that the seeds of deflation being sewn now will lead to inflation starting in the 2020s: "The same forces that contribute to deflation today will contribute to inflation tomorrow. For example, though austerity has been the name of the game in recent years, governments will start loosening the purse strings, bringing us from a deflationary world to an inflationary one. 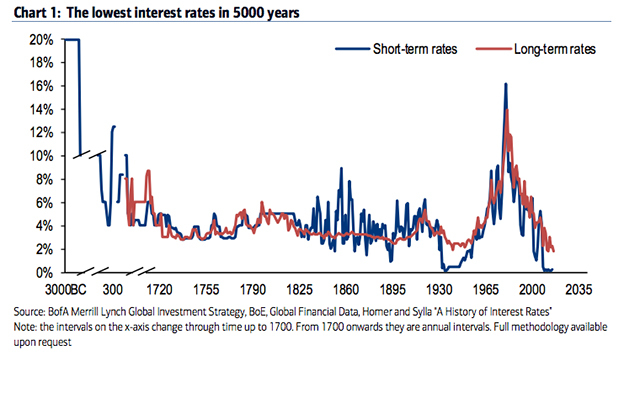 Everything central banks have done over the last 70 years sounded implausible," said Mr. Berezin. "Before they did it." Jesper Koll, Chief Executive Officer of WidomTree Japan, echoed Mr. Gignac using the Japanese economy as an example. "The case of Japan shows that printing money alone does not work. 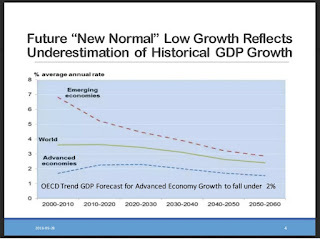 It must be linked with fiscal policy in order to produce the expected outcome of increasing GDP," said Mr. Koll. "Although its demographics will continue to decline, we think Japan will see the rise of a new middle class. This will be due to an increase in full-time employment, increased access to credit and a more active female workforce. Now would be a good time to be reborn as a 23-year old Japanese." 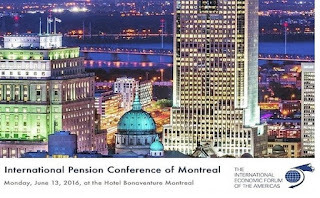 The International Pension Conference of Montréal will continue on Monday, June 13 with sessions at 10:30am and 3:00pm. Taking place at Montreal's Hotel Bonaventure under the auspices of the Conference of Montréal, the IPCM advances the debate on pension issues and solutions around the world. It is a unique opportunity for policy makers, political advisers, financial experts, actuaries and pension plan administrators to meet and exchanges ideas. To view the IPCM program, please click here. 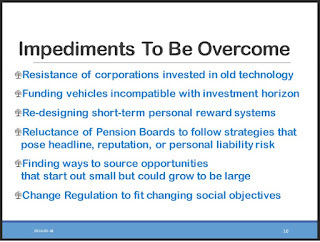 This was the first session of the International Pension Conference of Montreal (IPCM) and I quite enjoyed it. I got to briefly chat with Clément Gignac, my former boss at the National Bank Financial, who is just as passionate (and nervous) about financial markets as he's always been. 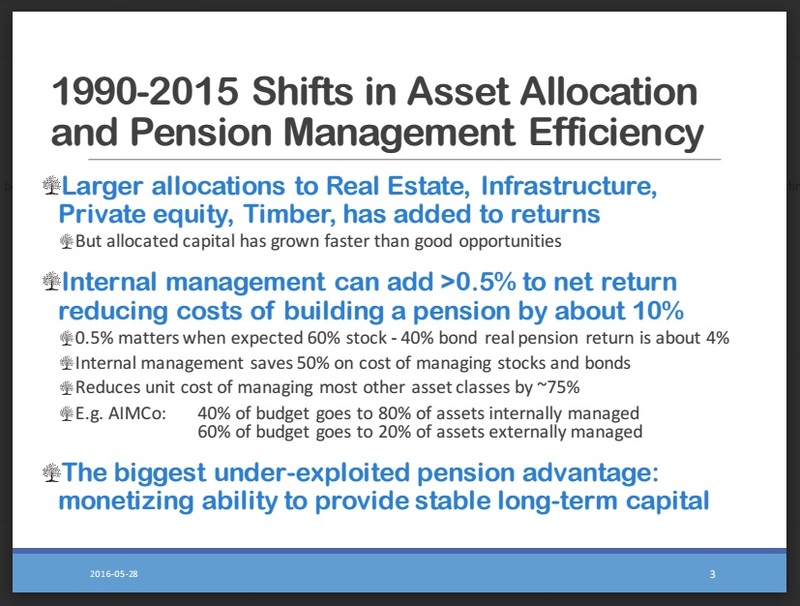 My sources tell me Clément is doing an excellent job on asset allocation at Industrial Alliance (good for him) and loving it. I also got to meet Marc Levesque of PSP Investments who is a very nice guy. He gave a solid overview of the different schools of thought when it comes to the economic morass we're experiencing. 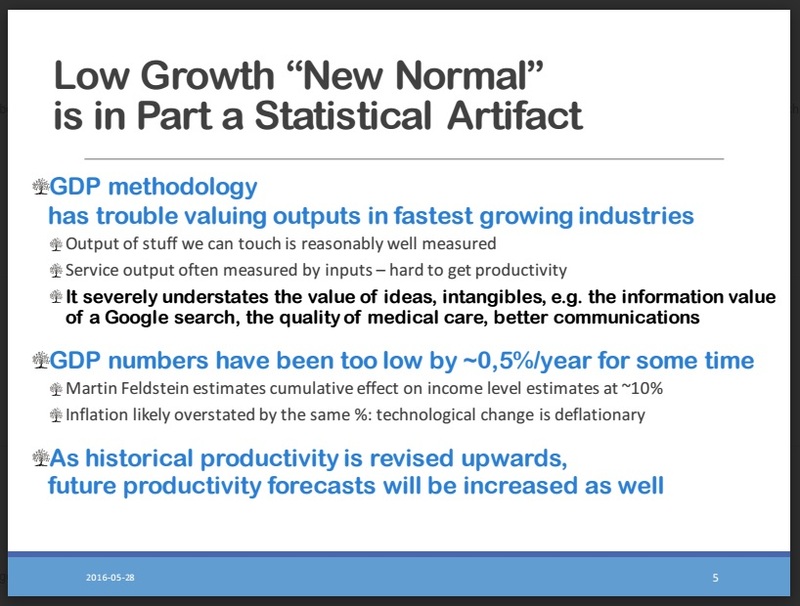 Marc didn't only emphasize demographic trends but also slower productivity as a factor weighing down growth. 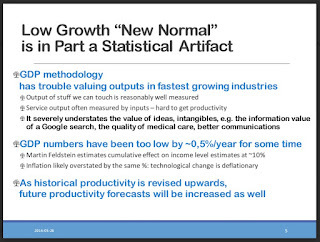 He did say rates will normalize but this will take time and they will normalize at a lower level than historic norms. Jesper Koll of WisdomTree Japan offered us some good news on Japan stating that "helicopter money" is stimulating consumer spending and housing (but not manufacturing) and that full-time jobs are plentiful for young Japanese graduates (98% get placed in a job). Koll stressed that immigration figures in Japan aren't as low as people think because there are a lot of "Chinese students studying in Japan" and many stay there after they graduate and that there are programs that attract people from all over the world to Japan. He said that immigration has slowly crept up to 5% of the population from 2.5% a decade ago. But for all his bullish talk on Japan's economy, Koll is a structural bear when it comes to the yen because he thinks the BoJ has become the buyer of last resort and Japan’s debt market has been “nationalized” in the process. "Once the BoJ owns 50% of the public debt, it will transform it into zero coupon bonds, which is bearish for the yen." Peter Berezin of BCA delivered a solid presentation where he said he thinks the reflation trade that started in early February is coming to an end and deflation will creep back into the system. He did say that the seeds of deflation being sewn now will lead to inflation starting in the 2020s, but what will happen four years from now is anyone's best guess. Where I agreed with Berezin is that the US dollar is going to take off in the second half of the year. He thinks the Fed will move either in September or December and that "even a marginal rate hike in the US will send the US dollar soaring when Japan and Europe are engaging in helicopter money and struggling with negative rates." I have strong doubts that the Fed will raise rates in 2016 but I'm worried that Larry Summers and Jeffrey Gundlach are right, namely, central banks are losing control and they're repeating mistakes of the past. Having said this, regardless of whether the Fed raises rates or not this year, I still think the endgame for the US dollar bull run isn't near and that it will rebound in the second half of the year (with all sorts of implications on risk assets and emerging markets; see my recent comments on whether US stocks are going to melt up and much ado about Soros). Anyways, that was the morning macro session which you can watch here. I also embedded it below. I'm glad they posted it along with other sessions on Vimeo here. Any mistakes I made above are mine so please watch the session when you have time. 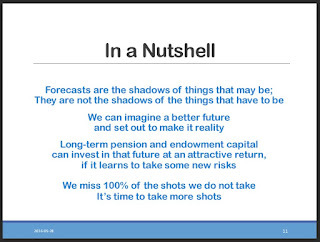 Zhu is on record stating the nasty few weeks in financial markets that kicked off 2016 could be the new normal and volatility is not going away anytime soon even if we're not in a global recession. Last year, the IMF recorded the most market volatility since 1929 but wild swings, he said, do not point to a global recession. "I do think it will have impact on growth, but not as a meltdown, not across-asset situation." At 10:30 am, I moved over to the Mont-Royal hall to listen to a discussion on low rates and pensions. This was an excellent discussion on pensions which was moderated by Bernard Morency, special advisor to the Caisse de dépôt et placement du Québec (CDPQ) and it featured Leo de Bever, AIMCo's former CEO, as well as Dirk Broeders, Senior Strategy Advisor for policy at the Bank of Netherlands and Rob Goldstein, Global Head of Blackrock Solutions. As of now, this session has yet to be posted on the conference's Vimeo site. If it is, I will post it below and will add more clips below as they become available. Dirk Broeders said that the Dutch are moving away from DB heading into the DC world. He said this will address abuses in the system and offer more flexibility and a tailor made life plan model for each individual. 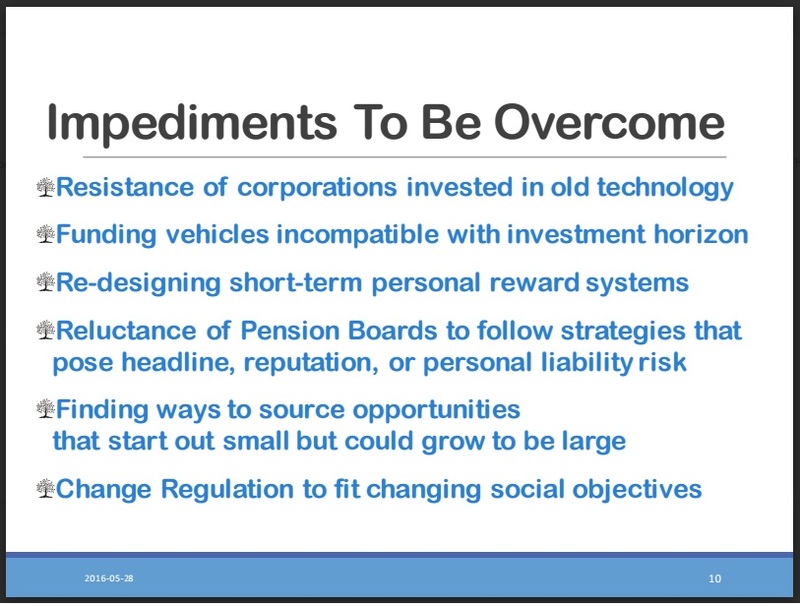 I wasn't impressed with his arguments or those of Blackrock's Rob Goldstein who also argued about empowering individuals and neither was Leo de Bever who told me right after: "It's crazy, we don't expect car mechanics to be financial wizards, that's not their job." 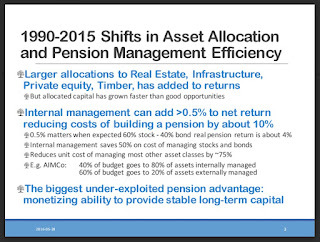 You already know my thoughts on defined contribution plans, I think they'll doom more people into pension poverty, and the fact that the Netherlands is moving away from DB toward this "hybrid DB/DC model" is reason to make me think they are failing to transform their retirement system for the better. 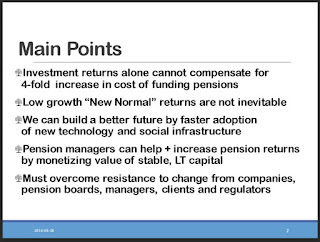 The best presentation of the entire conference on pensions was given by Leo de Bever. I met him a long time ago and his intelligence never ceases to amaze me. He thinks outside the box and he doesn't accept conventional wisdom on slowing productivity or that the status quo can't be changed. 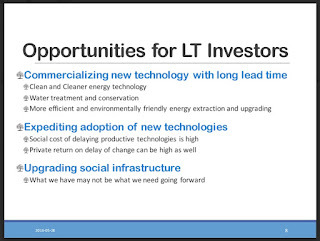 Leo was kind enough to share his presentation with me and told me to "emphasize that long term economic prospects are better than the forecasts suggest" and that "pension plans can earn a better return by providing patient capital to commercialization of new technology." 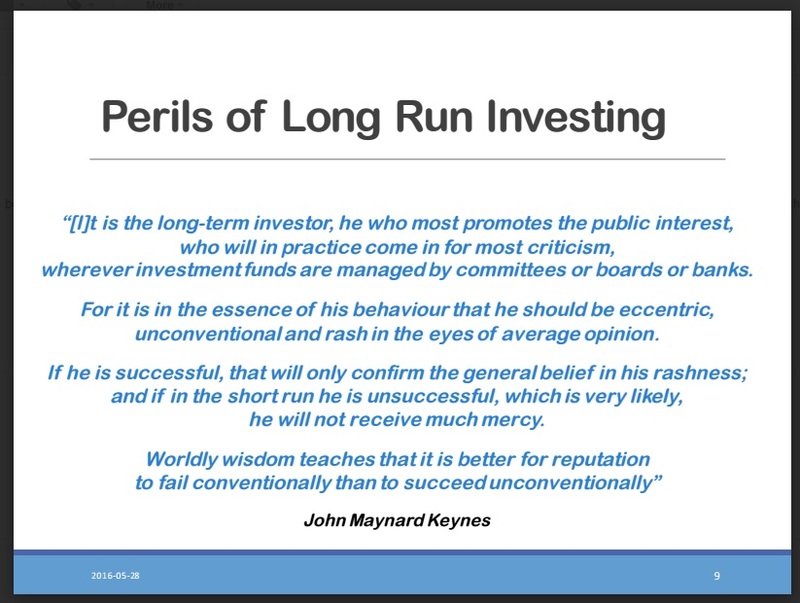 The key message here is if pensions talk about investing for the long run but focus on the short term results and avoid making interesting investments (to avoid headline risk in the short run), then they're doing their members a great disservice and impeding much needed economic growth. 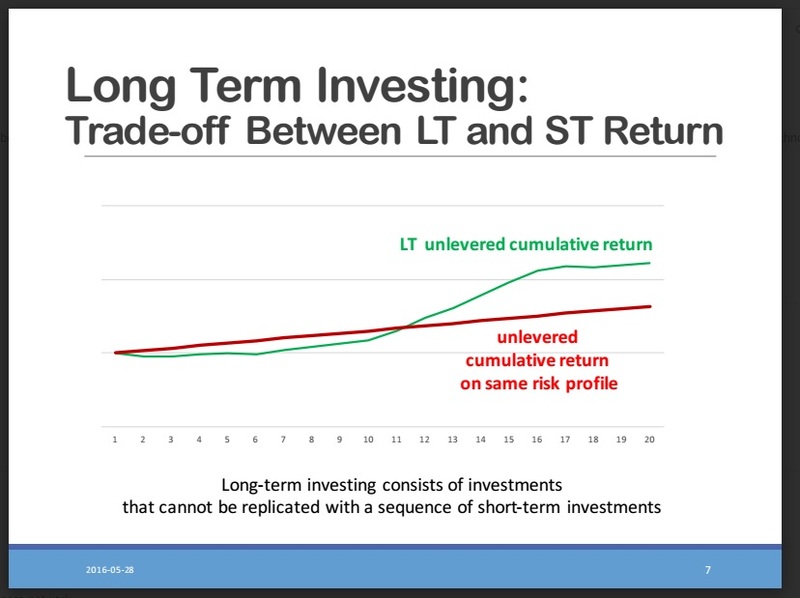 In fact, afterwards Leo and I chatted about this obsessive focus on headline risk. I told him that I see too many people of influence focusing on managing career risk, which I understand given my circumstances (it doesn't pay to stick your neck out!). 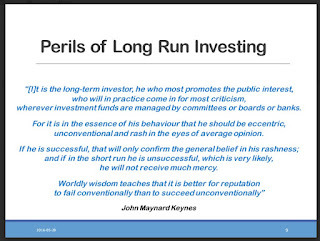 He told me that "inertia rules the day" and he's never seen so much risk-averse behavior and lack of original long-term thinking (although his message is one of hope, he seemed a bit disillusioned with the thinking at big pension and sovereign wealth funds). I can't blame him. 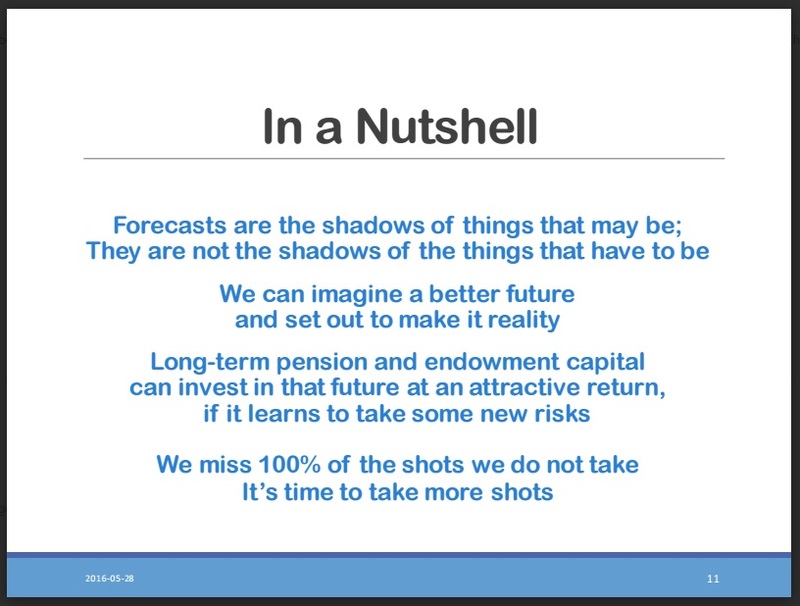 The message I got from this conference is that the new normal is terrible, we can't fight demographic trends and lower productivity growth so pensions need to accept this grim reality and navigate as best as they can in the future. 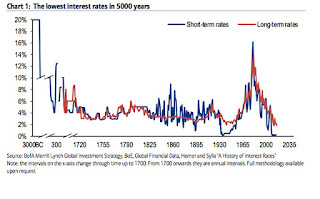 In his presentation, Henri-Paul went back 200 years (long enough) but the point is even if rates normalize, they're not going to soar. He then went on to explain the problems with DB plans throughout the world using data from the Mercer Global Pension Index report. Please keep track of all the sessions as they will likely be posted on Vimeo here. Below, I embedded the morning macro discussion and the inaugural session. I will add others as they become available here. 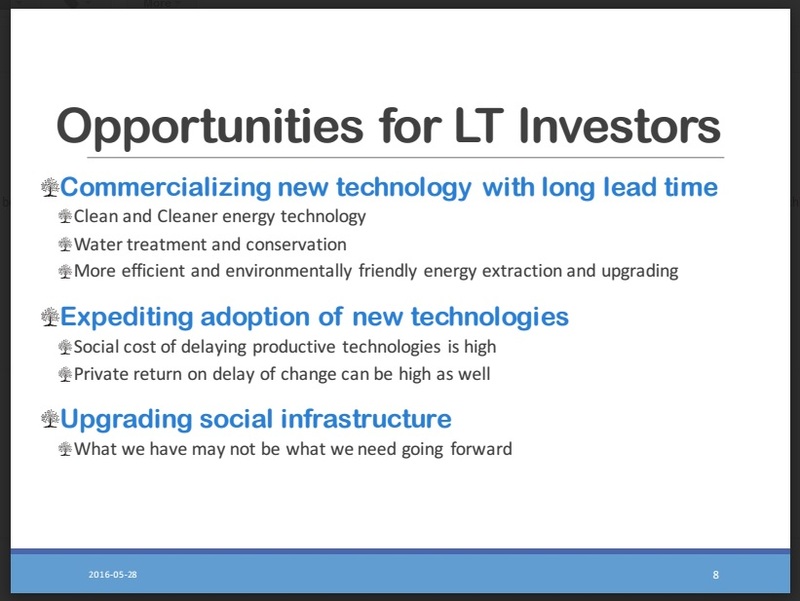 Also, Leo de Bever, Chairman of Oak Point Energy joins Bloomberg TV Canada's Pamela Ritchie to discuss why there's more investment needed in Canada's energy sector for new technology. On that note, please remember to kindly donate or subscribe to this blog on the top right-hand side to show your support. I thank all my supporters and the conference organizers for inviting me. I look forward to next year and highly recommend you attend this conference. Again, please note I will update this comment if more clips become available. 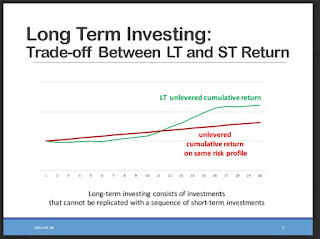 Teachers Wage War on Hedge Funds? Picking Up Canada's Pension Slack? Global Bonds Enter The Twilight Zone? Endgame For The Dollar Bull Run Is Near? Are US Stocks Going to Melt Up? ORPP an Impediment to Enhanced CPP?